Equifax auto finance leader Lou Loquasto pictures an industry landscape where finance companies rank dealerships based on risk and potential profitability, just like they do consumers as applications arrive in the underwriting department. By extrapolating the knowledge gleaned through static pool analysis, Loquasto explained how dealerships and finance companies still can capture potential business in the subprime space as the current cycle backs off the growth pattern seen for several years. The latest data Equifax shared with SubPrime Auto Finance News showed 1.37 million retail installment contracts were originated through March to consumers with a VantageScore 3.0 credit score below 620; deals generally considered to be subprime accounts. The figure represented a 7.3-percent decrease year-over-year. “Does that mean every dealership subprime is down 5 to 10 percent? Without looking at the data and knowing what we know about the business, probably not,” Loquasto shared during a recent phone conversation. “That would be pretty remarkable if you look at 30,000 dealerships, and they’re all down 5 to 10 percent. “We see dealers that are up in subprime and some that are down 25 percent,” he continued. So how are some stores moving on an upward trajectory in subprime? Loquasto explained that finance companies need analytics platforms to determine which dealers are a better fit for their book of business and provide the right amount of risk for their appetite. Equifax recently analyzed TradeSight metrics evaluating a series of dealers with a focus on subprime accounts in the 560 to 580 credit range. The chart below shows two dealerships with side-by-side comparisons that look at a handful of credit performance criteria, such as delinquency rates, average APR and length of months on the book. According to the data below, dealer A shows a higher propensity for customers with 30-plus and 60-plus delinquencies, as well as charge offs. However, dealer A also represents clientele with higher APR rates. Based on this data from platforms such as TradeSight, Loquasto pointed out that finance companies can best analyze which contracts and dealers make up the best opportunity for their book of business based on a number of credit performance and risk assessment data. “The difference in profitability of those two scenarios is dramatic,” he said. “Some dealerships where the performance is worse than you would expect and worse compared to their peers, some of those dealerships are down a lot in subprime. You say that makes sense. Lenders spotted something with that dealership, and so they’re pulling back and tightening up,” Loquasto said. 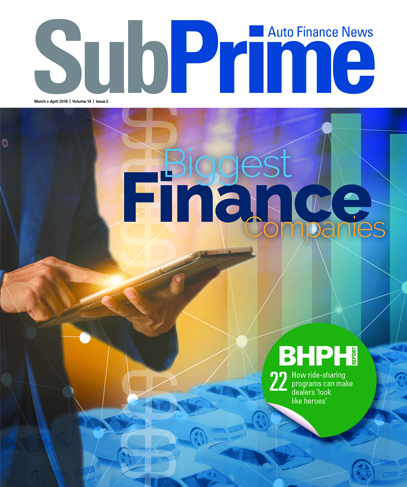 Loquasto acknowledged that sometimes dealerships have a negative reputation when it comes to subprime originations so finance companies simply tighten up underwriting across the board when they feel a market shift. He suggested that finance companies take a deeper analysis before just cutting. “Our industry is so sophisticated right now, especially in subprime, that if a lender was looking at 1,000 loan applicants, they would scrutinize those 1,000 loan applicants with sophisticated scores and data with people who have great experience choosing good borrowers from bad borrowers, and they’ll be able to rank order the least riskiest to the most riskiest, and they do an awesome job,” Loquasto said. “But they don’t do that with dealers so well,” he continued. “They don’t look at these 1,000 dealers and do a sophisticated analysis using all of the available data and sophisticated scorecards not only for the business they book, but the business their competitors book. And then have a sophistical ranked order list at the dealer level. Not just in subprime, Equifax data also showed a general slowdown in auto financing. Again through March, Equifax said 5.82 million auto loans, totaling $130.6 billion, were originated, representing a 2.0-percent decrease in accounts and a 0.1-percent decline in balances year-over-year from this time last year. Through March, Equifax found that 23.5 percent of auto loans were issued to consumers with a subprime credit score, and they accounted for 18.5 percent of origination balances. Equifax went on to mention the average origination amount for all contracts came in at $22,693, a 3.5-percent rise. The average subprime contact amount stood at $18,033, according to Equifax, which added that figure marked a 2.7-percent lift year-over-year. “Where we are in the cycle, there isn’t as much profitability out there for lenders. That’s why we’re talking about strategies like this so they can squeeze out every bit of profitability they can,” Loquasto said. “Three, four, five years ago when profitability was high, maybe lenders weren’t as diligent about squeezing out every dollar of profit. But now they are,” he continued. “If we’re in the seventh inning of this cycle and lenders can get into the good habit of doing a better job rank ordering dealer risk then as soon as the cycle turns like we know it will and we get back into growth, they’ll have built in these good habits. “Just like every customer has to be looked at differently and the industry does a great job of that, every dealer can’t be looked at the same,” Loquasto went on to say.